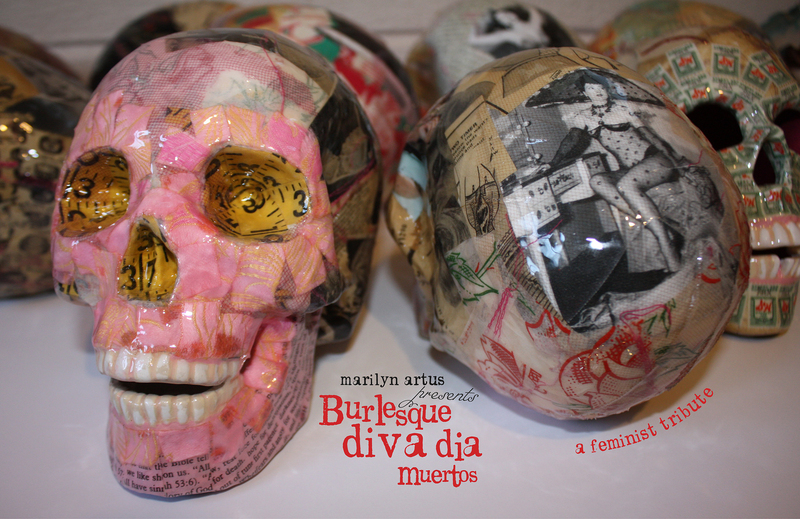 In this Artist Uncovered series interview, I speak with visual artist, Marilyn Artus, about her show, Burlesque diva dia Muertos, on display at a.k.a. gallery 3001 Paseo in Oklahoma City. Marilyn, briefly describe yourself for those unfamiliar with you. I am a visual artist living in Oklahoma City. After graduating from the University of Oklahoma with a bachelor of Fine Arts I became a commercial artist working in the gift industry. In 2003 I co-founded The Girlie Show, an all female art festival that had a 10 year run in Oklahoma City that encouraged female creativity through out the US. I then left my commercial art job and began a career as a visual artist in 2008. In 2009 I founded a branch of Dr. Sketchy’s Anti Art School, a cabaret life drawing class that I ran for four years in OKC. I have exhibited my art works around the US. How did you get started and interested in creating art? My parents took my brother and I to the ballet and the opera in Tulsa and had instilled an appreciation for the arts at an early age. But, I really realized my passion after a had a great art teacher in high school. What is your artist statement for Burlesque diva dia Muertos? Some feminists decry neo-burlesque. I am not one of them. I was a burlesque promoter for 3 years and the performers I met were talented and expressed female sexuality in a joyful way. Their skills, costumes, props and artistry was inspiring. The neo-burlesque movement is, in my opinion, filled with talented performance artists. 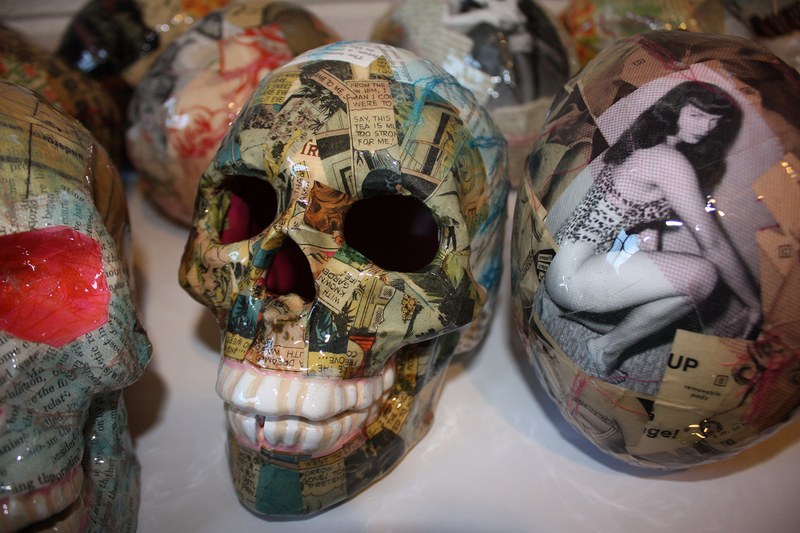 I have created 16 life size skull mixed media sculptures as a tribute to many of the founding divas of burlesque. Their lives were tragic and fabulous. They were working and on their own when most women were still not in the work force. Were they exploited or were they ground breaking feminists? I hope my works encourage you to consider their sexuality and yours. Why represent the performers will skulls? I lived in San Antonio, Texas for 2 years and fell in love with The Day of the Dead Festival. I though the combination of this and tributes to dead burlesque performers would be an interesting show. How did you make the skulls? The skulls are ceramic. I printed each performer to be tributed on to canvas and applied them to the skull. I then machine stitched vintage paper materials and fabrics such as measuring tape, S&H green stamps, 1950’s lingerie ads and religious pamphlets. 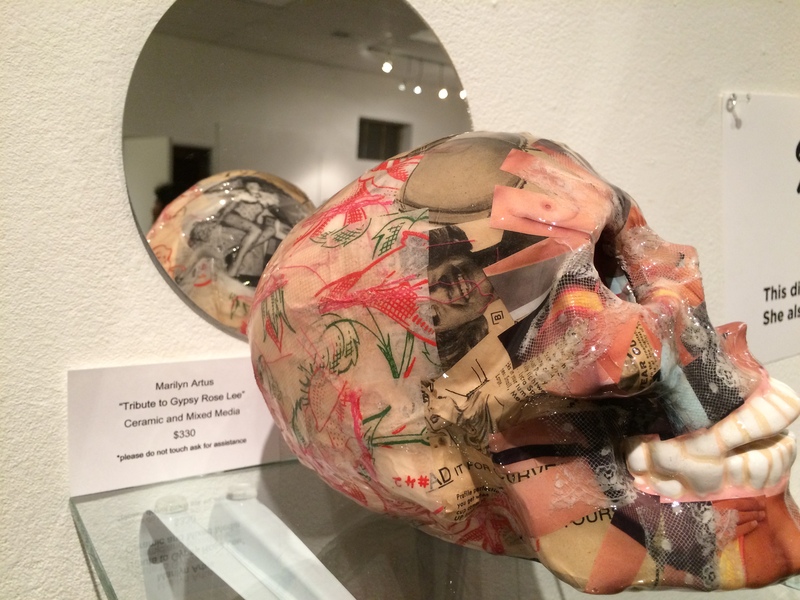 Then with an archival glue, all the items were attached and the skull was finished with a high gloss art resin. Where did you find your information on all of the performers? [pullquote-right]”I try to have at least 5 different resources of materials for each woman I tribute. It has amazed me how different the accounts can be depending on the writers take on the person they are writing about.”[/pullquote-right]Many of my works have been tribute pieces to women of the past. A few years ago I created a show honoring women of the suffragette era. I use a combination of vintage and new books, plus of course, the internet for research. I try to have at least 5 different resources of materials for each woman I tribute. It has amazed me how different the accounts can be depending on the writers take on the person they are writing about. History can be very arbitrary. What music, if any, did you listen to when creating this exhibit? I have very eclectic taste in music. I listened to mostly songs created by women or music that these performers would have danced to. At the opening I had this music playing. How is this exhibit different and similar to other works you’ve done? I am a social commentator. I want to make works that get the viewer to think about being a woman and the complexities that go with it. Female sexuality is always an issue I am trying to understand myself and my works challenge the viewer to think about their own. This is the first time I have created sculptures. My past works have always been 2-dimensional. Give a few examples of how the elements of each skull connect and relate to the inspired performer. The tribute piece to Bettie Page has vintage fabric measuring tape in the eye and nose sockets, this being a symbol for the constant measurement of female beauty and the importance that has been placed on it in our culture. The back of the skull has lingerie ads from the 1950’s, Bettie was photographed in these garments and they are a huge part of who she was. The jaw of the skull has Christian pamphlets that were handed out door to door. This related to her later life when she became a born again Christian. The color pink is in this work and is often in my pieces. It is a hyper girly symbol that many feminists decry. I find that it instantly visually tells you I am creating works that have a female perspective. 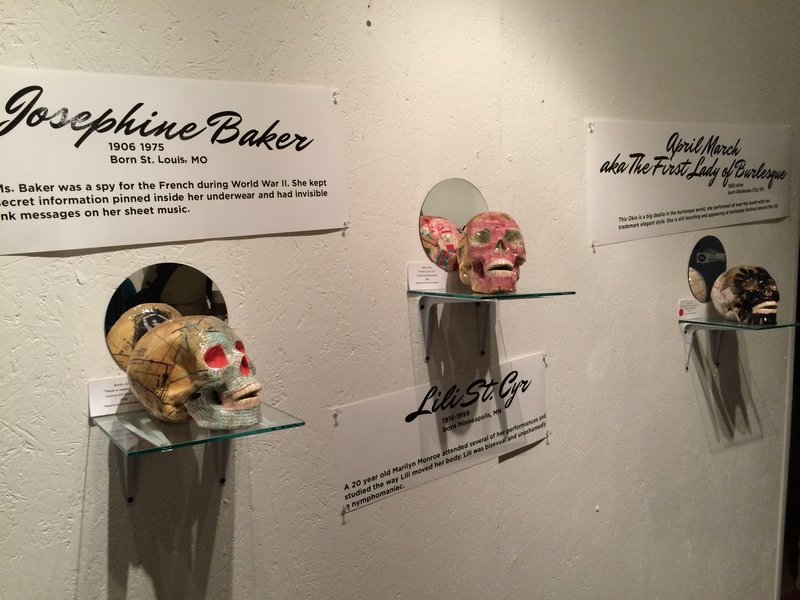 What was the greatest challenge when working on the Burlesque diva dia Muerto exhibit? The greatest challenge was creating the sculptures. I had not worked this way before and it was an adventure. I knew I wanted a super high gloss to them and I had never worked with art resin before. What do you want people to take away when viewing this show? I create art but I can’t control what people may think about it. I respect each person’s interpretations of the works. There are no wrong answers. But, I do hope I can give a perspective on being female and challenge the viewer to think about what exactly that is and how it is different from men. What advise do you have for aspiring artists? [pullquote-left]”Don’t fear rejection from a show or gallery. I get rejected, every artist does.”[/pullquote-left]Be constantly challenging yourself. Get connected with your local art community and network with other artists. They will teach you things and you will teach them. Don’t fear rejection from a show or gallery. I get rejected, every artist does. For me it is a very natural process, making art, I am a feminist interested in women getting equal pay, feeling safe and free from sexual assault and having the same opportunities as men. These passions are part of each work I create. An abstract question: What is your favorite kind of ball? This crazy question makes me think of a costume ball. I see elaborate masks and dresses from the Victorian era. Not a great period for women’s rights, but wow, visually amazing. They can go to marilynartus.com or follow me on Facebook or Twitter. This show is up at a.k.a. gallery 3001 Paseo in Oklahoma City until October 28th, Monday-Saturday noon to 5 p.m. There will be a closing reception on October 28th from 5-8PM with a performance by neo-burlesque performer, Ilsa the Wolf of Tulsa, OK at 7PM that evening.